One of the Best Suburbs in Houston, the Woodlands is home to bustling business and employment centers, retail and entertainment hubs, and serene neighborhoods. The Woodlands is a vast 28,000-acre master-planned community 28 miles north of Houston’s bustling business centers and neighborhoods. UPSCALE RETAIL AND DINING: The Woodlands Town Center is home to Market Street, The Waterway District, The Woodlands Malls, and The Cynthia Woods Mitchell Pavilion. Around 200 restaurants, cafes, and bars along with the several stores and other commercial establishments are all within these entertainment and retail centers. OUTDOORS AND NATURE: True to its name, The Woodlands features lush neighborhoods with plenty of green spaces. With its 130 parks, 1,700-acre nature preserve, and several lakes and ponds, the community offers a unique, “living with nature” atmosphere. PLENTY OF ACTIVITY CENTERS: Apart from 7,790-acre of green space, The Woodlands also features a wide variety of facilities for golf, tennis, kayaking, and other outdoor activities. Over 200 miles of hike and bike trails line the master-planned community. BUSINESS CENTERS: The Woodlands has more than 20 million square feet of office space with 60,000+ employees. Notable companies in the area include Chevron Phillips, Baker Hughes, Maersk Line, ExxonMobil, and SWN, among others. The Urban Land Institute gave The Woodlands a Special Award of Excellence in 1994. See the best places to live in the Woodlands area for strong property values, amenities, schools, and great access to retail, dining, and entertainment right here. Due to the township’s large area and number of smaller communities and neighborhoods, The Woodlands real estate market can be challenging to navigate. Enter your email to get this free The Woodlands guide in easy-to-read PDF format. Bonus: Also see how this area compares with nearby top neighborhoods. The Woodlands is often mentioned as one of the best Houston suburbs, and with good reason. The vast master-planned community offers great amenities, excellent schools, and a wide variety of housing options. Conveniently located along the North Freeway (I 45), The Woodlands homes have excellent access to nearby Houston neighborhoods. Schools, retail centers, restaurants, and entertainment hotspots are minutes away as well. The Woodlands Town Center is home to Market Street, The Waterway District, The Woodlands Malls, and The Cynthia Woods Mitchell Pavilion. 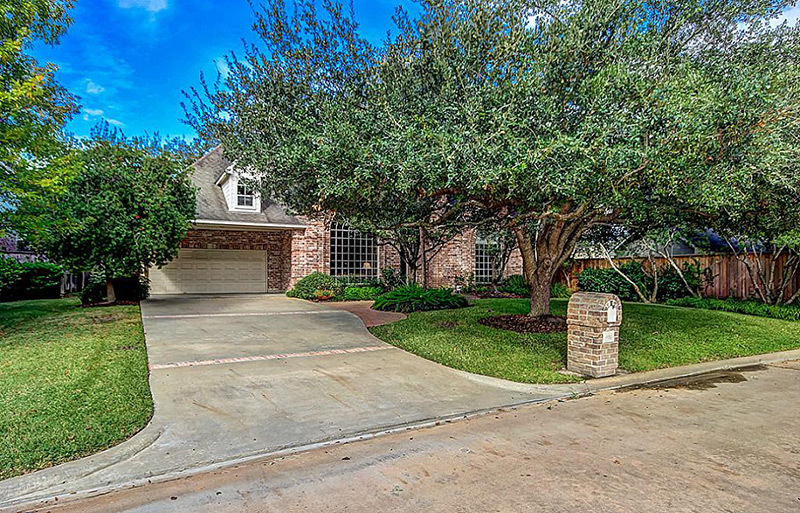 The Woodlands homes are zoned to two of the Conroe Independent School District’s top rated schools, The Woodlands College Park High School and The Woodlands High School. Divided into several distinct neighborhoods, The Woodlands offers a wide range of housing options – from traditional single-family homes to townhomes, and from grand estates to lakefront homes. The Woodlands real estate have posted strong appreciation rates thanks to the community’s continuing popularity. The community was originally envisioned by George P. Mitchell, and was later acquired by the Howard Hughes Development. Today, the Woodlands operates as a township. The Woodlands’ subdivisions include Creekside Park, Sterling Ridge, Carlton Woods, Alden Bridge, Cochran’s Crossing, Indian Springs, College Park, Panther Creek, and Grogan’s Mill. Each village features its own community center and is subdivided into smaller neighborhoods. 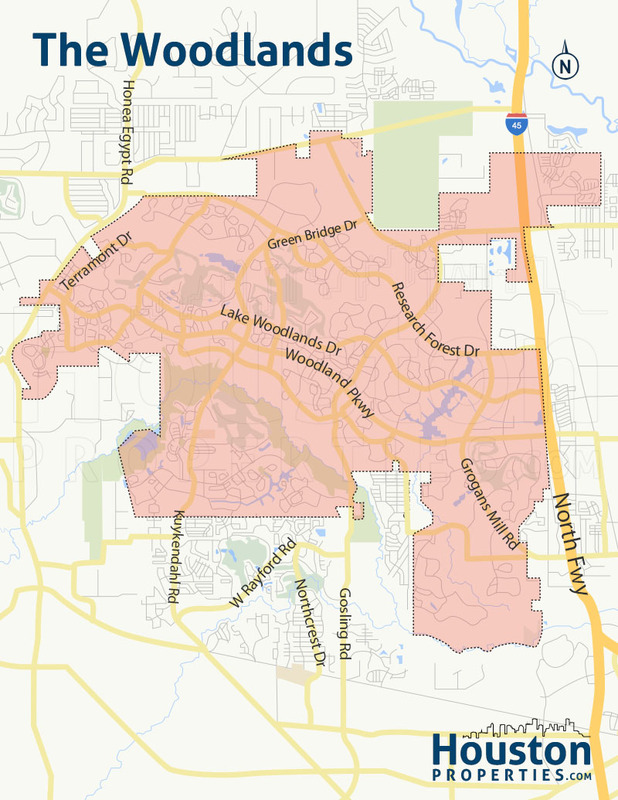 The Woodlands’ many neighborhoods have covenant restrictions. Some neighborhoods feature homes in gated communities, greenbelt and lake areas, and within golf courses. 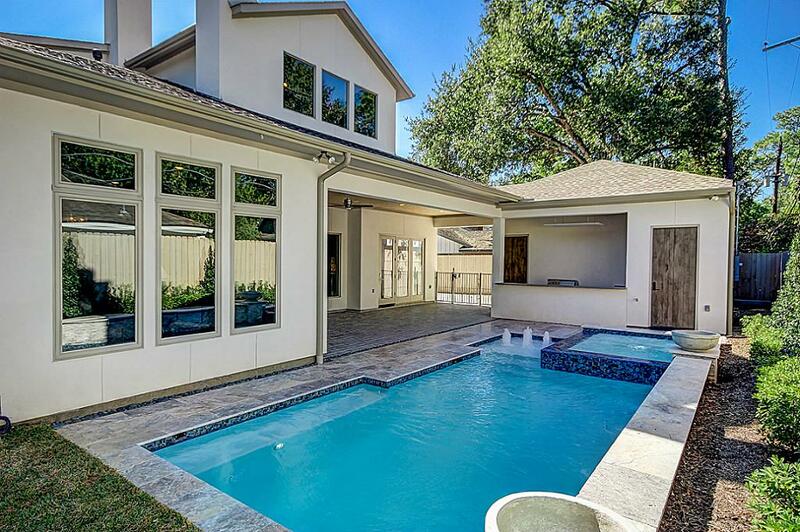 The Woodlands homes for sale are typically priced between $150,000 to more than $15,000,000. The Woodlands is located about 30 miles north of Downtown Houston. The vast 43.9-square mile master-planned community is nestled west of I-45, south of FM 1488, and northwest of Spring, some miles outside the Beltway. The Woodlands is divided into sections, with several neighborhoods. Some sections are dedicated to business, retail, and entertainment. The Woodlands is zoned to three different school districts. Most homes in the Woodlands within Montgomery County are zoned to the Conroe Independent School District. Some homes in Sterling Ridge are zoned to the Magnolia Independent School District, while Creekside Park homes in Harris County are served by schools from the Tomball Independent School District. *Note: Due to the number of schools serving The Woodlands homes, we opted to list them and highlight those that have been named National Blue Ribbon School. For full list of schools in the area, please check our Best Houston Schools guide. Buckalew Elementary School at 4909 West Alden Bridge Drive. Bush Elementary School at 7420 Crownridge Drive. Coulson Tough Elementary School at 11660 Crane Brook Drive. Creekside Forest Elementary School at 5949 Creekside Forest. David Elementary School at 5301 Shadowbend Place. Galatas Elementary School at 9001 Cochran’s Crossing Drive. Glen Loch Elementary School at 27505 Glen Loch Drive. Houser Elementary School at 27370 Oak Ridge School Road. Kaufman Elementary School at 2760 Northridge Forest. Lamar Elementary at 1300 Many Pines Drive. Oak Ridge Elementary School at 19675 I-45 South. Powell Elementary School at 7332 Cochran’s Crossing Drive. Ride Elementary School at 4920 W Panther Creek Drive. Sam K. Hailey Elementary at 12051 Sawmill Road. Collins Intermediate School at 6020 Shadowbend Place. Deretchin Intermediate School at 11000 Merit Oaks Drive. Knox Junior High School at 12104 Sawmill Road. McCullough Junior High School at 3800 Panther Creek Drive. Mitchell Intermediate School at 6800 Alden Bridge Drive. Vogel Intermediate School at 27125 Geffert Wright. Wilkerson Intermediate School at 12312 Sawmill Road. York Junior High School at 3515 Waterbend Cove. The Woodlands High School at 6101 Research Forest Drive. Named a National Blue Ribbon School in 1998, The Woodlands High School has received several awards. In 2011, TWHS was named one of Newsweek’s Best High Schools. The school offers an extensive College Board Advanced Placement program, with courses in Chinese Language and Culture, Environmental Science, European History, French Language, and World History, among others. Apart from its academics, The Woodlands High School is also known for its excellent athletics programs and extracurricular activities. The Woodlands College Park High School at 3701 College Park Drive. Oak Ridge High School at 27330 Oak Ridge School Road. Oak Ridge High School 9th Grade Campus at 27310 Oak Ridge School Road. The Woodlands High School High School – Ninth Grade Campus at 10010 Branch Crossing Drive. Magnolia High School at 14250 FM 1488. Tomball High School at 30330 Quinn Road. The Woodlands Preparatory School at 27440 Kuykendahl Road. The Woodlands Christian Academy at 5800 Alden Woods Drive. To find an updated listing of all The Woodlands real estate zoned to any specific public school, please send an email to Paige Martin at Paige@HoustonProperties.com with the property preference and budget that you’re working with. The Woodlands real estate have posted impressive appreciation rates over the last 10 years. Many factors have contributed to this, including new development in the area and the community’s continued popularity. The community’s wide variety of housing options, great community amenities, and high quality of life are also major factors. Note: Due to the large number of home types, neighborhoods, and smaller communities within the Woodlands, it’s better to check out real estate trends in specific areas. Email Paige Martin at Paige@HoustonProperties.com for more information. 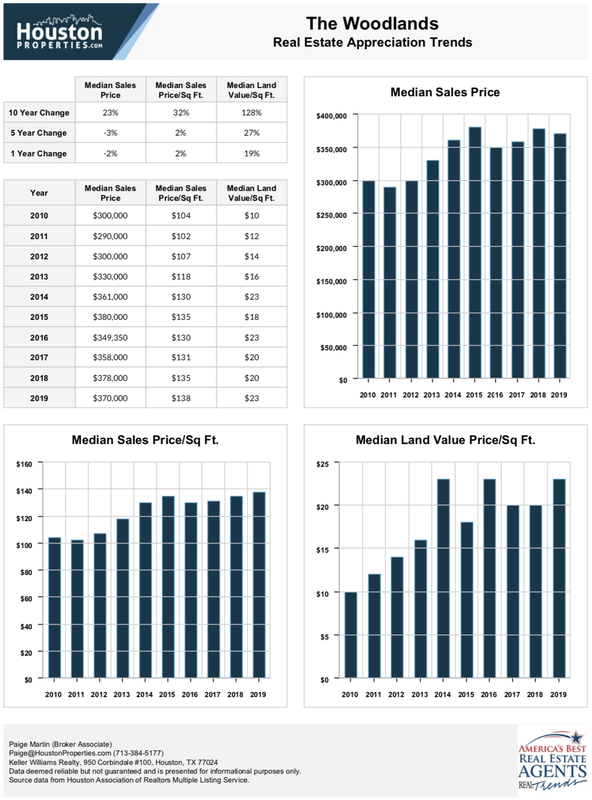 For updated information regarding The Woodlands real estate pricing and trend analysis, please contact Paige Martin at Paige@HoustonProperties.com. As envisioned by George P. Mitchell, The Woodlands features a wide range of housing options, from affordable to luxury and from one-story traditional homes to grand estates. Some of the master-planned community’s older homes are bungalows on mid-sized lots (by Houston standards). Three- to four-bedroom floor plans are common, with home sizes ranging from 1,100 to 2,000 square feet. These older homes date back to the mid-1970s and some have been updated and renovated. New construction The Woodlands homes, on the other hand, are typically bigger, with 2-story 3- to 4-bedroom floor plans. Home sizes are between 1,500 to more than 3,500 square feet. The Woodlands luxury real estate include grand estates with up to 11 bedrooms, on sprawling 80,000 square foot lots. Some of the most expensive homes in the area can feature living spaces of up to 30,000 square feet, and lot areas of more than 180,000 square feet. Architectural styles vary, including French, Mediterranean, Modern, Contemporary, and Traditional designs. The Woodlands single-family home prices can range from $130,000 to more than $15,000,000. There are plenty of townhomes in The Woodlands, most of them new construction or recently constructed. Neighborhoods like Sterling Ridge, Creekside Park, Alden Bridge, and Forest Lake feature townhomes in different floor plans and architectural styles. The Woodlands townhomes are typically smaller, featuring 2 to 3 bedrooms, though larger properties can offer as many as 4. Home sizes can range from 1,500 to 3,700 square feet. Prices for townhomes in the area start at around $150,000 and can go for more than $650,000. Condos are a relatively new addition to The Woodlands’ housing options. Multi-family developments, like One Lake’s Edge and The Millennium Six Pines, are located within The Woodlands’ mixed-use districts. In 2015, the Treviso at Waterway Square was announced, a 23-story high-rise condominium within the community’s Waterway District. Once completed, the luxury condo building will feature 84 units with one- to three-bedroom floor plans available. Floor areas will range from 1,200 to more than 3,500 square feet. Units will start at $650,000. 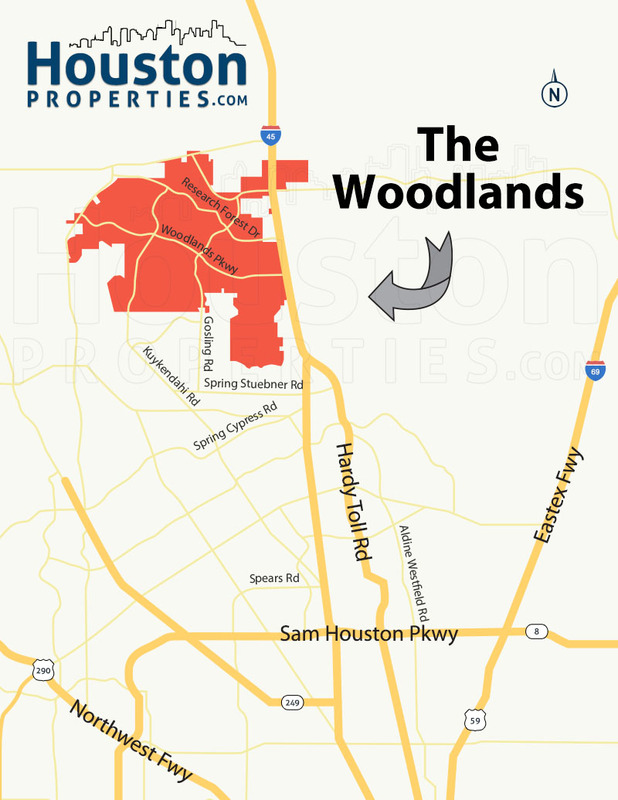 A brainchild of oil tycoon George P. Mitchell, The Woodlands started out as a suburban development. Mitchell’s original plans included office parks, hotels, malls, schools, and golf courses. The master-planned community opened in 1974. The Woodlands Corporation was previously under Mitchell Energy & Development, and has changed hands a number of times over the years. In 2011, it was acquired by the Howard Hughes Development Corporation. Since opening its doors, The Woodlands has grown with a number of residential and commercial developments. The community is divided into 9 distinct districts called villages, two of which are named after the Grogan-Cochran Lumber Mill which used to occupy the area. Today, The Woodlands is home to a number of companies, neighborhoods, gated communities, outdoor entertainment venues, golf courses, and retail centers.